Remove air breather hose from transaxle assembly. Do not bend the air breather hose to prevent damage to the hose. Securely install the clips to the harness bracket. 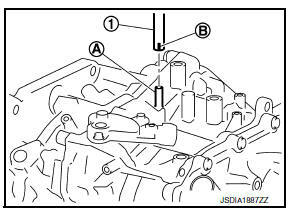 Be sure to insert it fully until its end reaches the stop when inserting air breather hose (1) to transaxle tube (A). Install air breather hose to transaxle tube so that the paint mark (B) is facing frontward.